Last year, Toby and Jodie extensively renovated the back of their terrace house. They created a new living and dining area, a new kitchen, new bathroom and powder room. The new addition is filled with light, has great flow indoor-outdoor and an eclectic warm look. After I designed the kitchen, I was asked to come up with some ideas for the new bathroom. Toby travels around the world and his brief was: “I want a Hilton bathroom at home”. The design process went smooth, as both Jodie and Toby were open to new ideas. 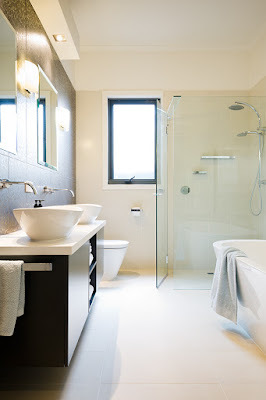 The first two versions of the bathroom were a soft minimalist style, with a modernistic composition of volumes, but version three was the one that made them both exclaim: “Wow, we didn’t expect that!” The third design proposition introduces a touch of baroque that contributes to the overall bathroom of “Feeling special”. The new bathroom is well balanced, has a classy touch, a soft and rich feel and is airy and light. The feature wall with a baroque, velvety dark pattern on a silver background, creates a dramatic backdrop for the graphite suspended vanity unit, Venetian mirrors and complementary wall lighting. The pattern from the feature wall continues on to the other three walls, but on a white on white version: a delight for the eye keen on details. The free standing bath creates a sense of luxury and freedom. Its pure oval shape, complements well on the bench basins, also ovals. A Large frameless shower with rain showerhead was Toby’s specific request so the bathroom feels like a subtropical retreat. 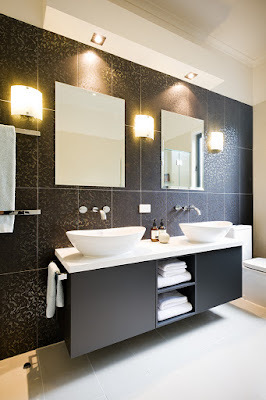 Led rope lighting, surrounding the wall storage with mirror doors, contributes to a serene atmosphere during evenings. 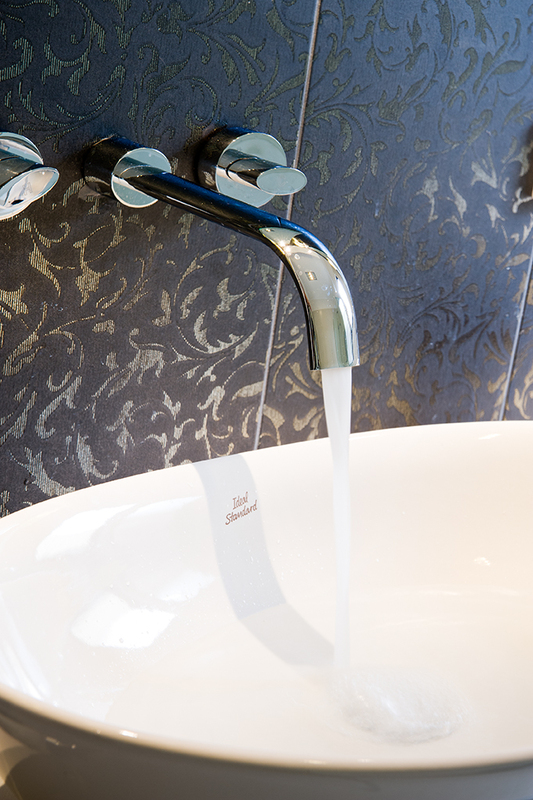 Main bathroom, with its new baroque luxurious look, adds a soft gentle and rich touch to the overall home, composed around warm tones and subtle contrasts.